As it turns out, while this sight is stunning, it's far from rare. "It's spectacular but not unusual," Dr. George Burgess, Director of the Florida Program for Shark Research, told The Dodo. "Whenever you get an aggregation of fishes like what you're seeing here, there are going to be predators there - even if those predators are normally solitary, like sharks are." 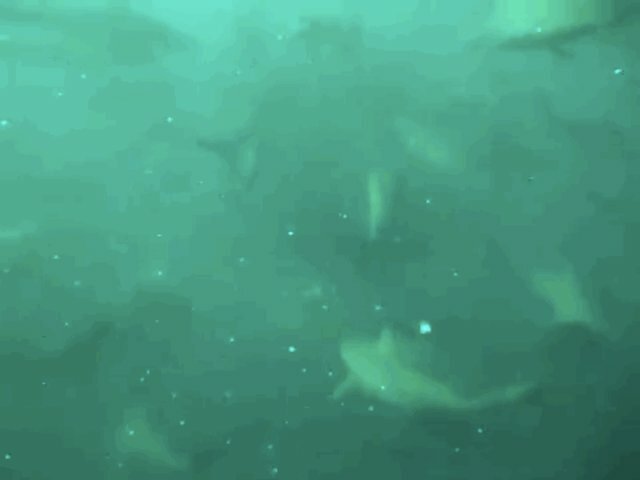 "There are probably 10 to hundreds of sharks gathering at any given time," said Dr. Neil Hammerschlag, research scientist at the University of Miami's Rosenstiel School of Marine and Atmospheric Science. "But it's dynamic - the fish are moving around like the wind, or like a flock of birds that's always changing shape. It's ephemeral." This isn't the only gathering like it in the world - but it is one of the largest. And while it's total biomass rivals that of East Africa's famous wildebeest migration, it's certainly not without its threats, said Burgess. "The situation with sardines is that their biggest predator is humans," he said, noting that overfishing has the potential to cause big problems for the sardine run - and the animals that rely on it. "Many organisms count on that seasonal resource for food. A reduction in the number of the sardines would have a very deleterious effect on all of those organisms because they all depend on the sardines."